We're starting into the fall season, and there's only about six weeks of sailing left before we pull our fleet from the water, still time enough to get out for a few good sails. For me, it's been a great summer on the water. I've enjoyed many good sails with friends both in and out of Sail Chicago, but what I've enjoyed most is my experience as a Tiller Time skipper. Passing on my knowledge and love of sailing to others is a real thrill for me, and it's part of the "service" that members of Sail Chicago perform to encourage the sport of sailing in the Chicago area. I can only assume that members who are instructors, on maintenance teams, or who are involved in other areas of service feel the same way I do. One young woman has been with me on several Tiller Times this summer. I've watched her progress from being a rather timid beginner to becoming a real master at the helm. She's turning into a great sailor in no small part because she's out on the water a lot. Our sailing instruction program is one of the best--if not the best--in Chicago, but it's also true that the only way to become a great skipper is to practice, practice, practice. So, while there's still time this season, let's all get out on the water and practice our sailing skills. Two of the articles in the August issue of Between the Sheets, "Board Notes" and "From the Editor," may have misrepresented the seriousness of the boating incidents/accidents reported to our Safety Director so far this year. In a note to the Board, John Lemon, our Safety Director, states, "I think it is worth noting that while we have had a few incidents this summer, there have been no groundings, no significant damage to our boats, and no boats out of service due to incidents/accidents. That is a big improvement over the past couple years." Every year, Sail Chicago ends the sailing season with festivities, food, drinks, and member recognition, and we are thrilled to invite our members, students, and their guests back to Columbia Yacht Club for a third year. Join us for a buffet dinner, cash bar, and a chance to celebrate a successful sailing season with fellow Sail Chicago members on Friday, Oct. 5 at 6:00 p.m. We will recognize those who have excelled in the organization, either through their achievement or through their volunteer service. This year, the event will include our second annual silent auction fundraiser, and it's going to be even bigger and better than last year! A number of awesome companies have donated products and tickets to support Sail Chicago, including Ronstan, Harken, Spinlock, Quantum, Shedd Aquarium, Copper Fiddle Distillery, Chicago Athletic Clubs, First Ascent, City Winery, and more! All proceeds will go toward fleet renewal. The event is open to members, students, and 1-2 guests. The cost is $30 per person and there will be a cash bar. Email Sarah Wirth with questions about the event and Rachel Granneman for questions about the silent auction. More details and registration are available on the event page website here. FINAL HAPPY HOUR OF THE SEASON! 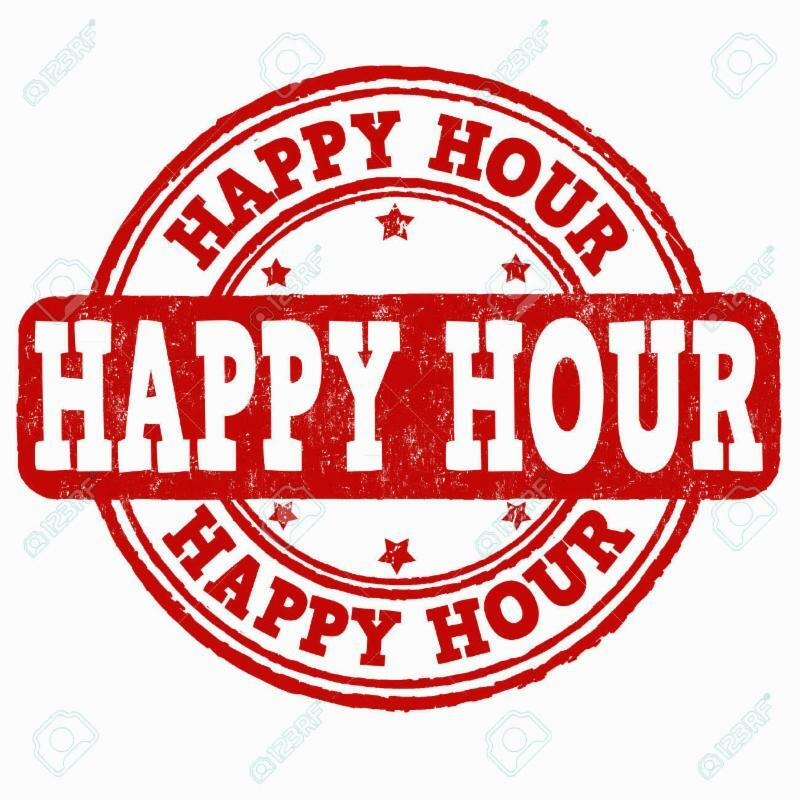 The first 10 people to come to our last Happy Hour of the season will receive a free drink on Sail Chicago! We will be at Elephant & Castle from 5-6:30 p.m. on. 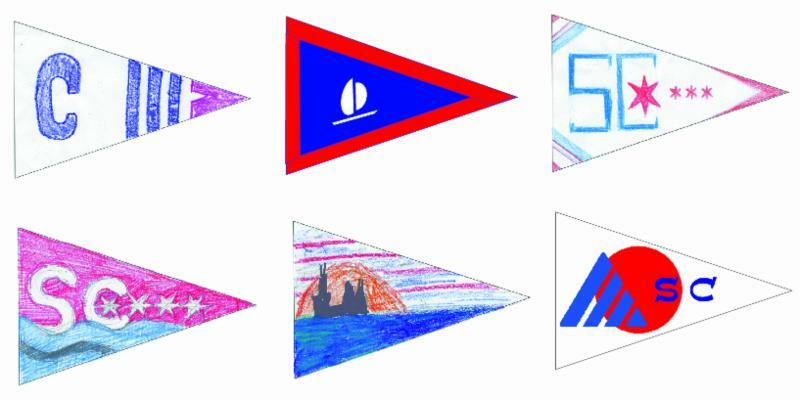 VOTE FOR THE SAIL CHICAGO BURGEE! The deadline for voting is September 22. Members and students will choose the top 3 designs, and then the Board will make the final determination. We hope to then have our new Sail Chicago burgees available on display and for purchase at our End of Season Dinner on October 5! GET A CREW OR BE CREW...AND GO SAILING! September's here, and we've got lots of good sailing days left in the season. If you need crew or you want to crew in order to get out on the water, our Share-a-Sail Program is for you. Just go to Google Groups and search for Share-a-Sail. Register your name, first and last, and your email address. 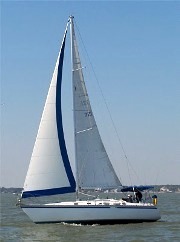 Then you'll be able send and receive emails to and from other participants who are eager to sail with you. Replies go only to the sender, so you will not be plagued with responses to other senders--there is no "reply to all." To post an email in Share-a-Sail specify the date and time you plan to sail and your name. It's that easy! Questions? Dawn Milne, for the photo. We're on Facebook! 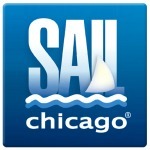 If you are, too, be sure to "like" and "follow" our page at: https://www.facebook.com/sailchicago. You'll get updates, reminders, and other information on Sail Chicago events and activities. You'll also get a sneak-peak at the silent auction items that will be part of our fundraiser at the End of Season dinner, October 5. Member Jay Owens sent us a recent article from Inverness Life. It details the life of long-time Sail Chicago member Vern Deason and his wife Medora. Vern was a very active member of Sail Chicago in past years and contributed much to its founding and initial success. 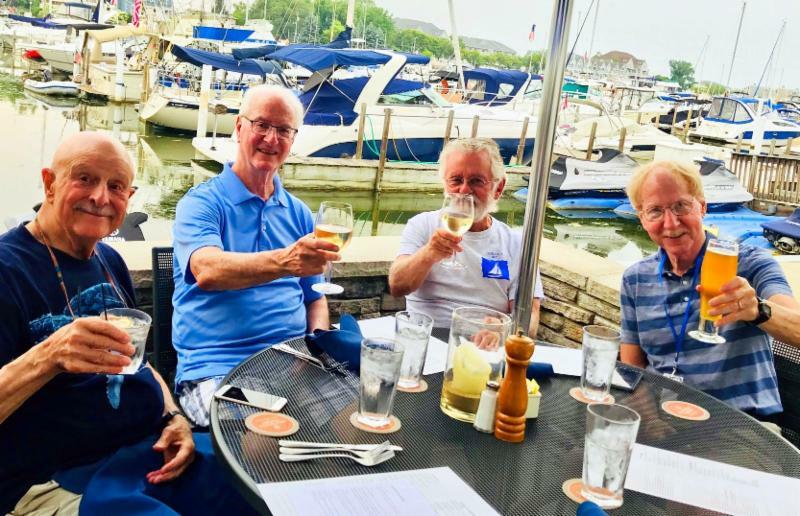 With no wind on Monday, August 13, Jay Owens, Ken Lapin, Norm Linde, and Bob Lapin motored to Michigan City where we had a lovely meal at Fiddlehead Restaurant. Calypso motored at 6.7 knots for a quick trip. On Tuesday, the winds were fair as we headed to New Buffalo, but as soon as the sails went up, the wind died, and we forced to motor to New Buffalo. We spent two nights in New Buffalo to avoid storms in the forecast. We ate twice in the Bentwood Tavern (see photo) after a swim in the Osleka Marina's pool. On Thursday, with no wind, we motored to Montrose, where we were treated to a welcome by the Air Force demonstration team, the Thunderbirds, doing a practice session. 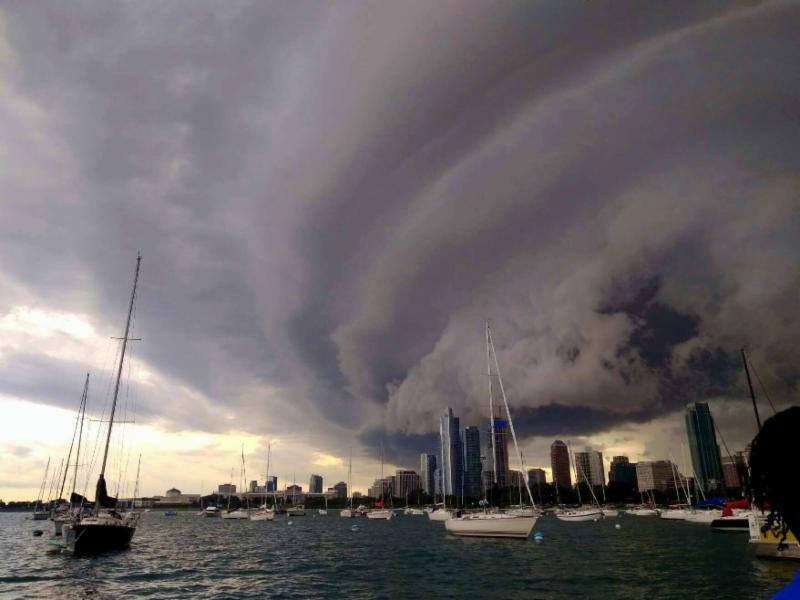 After a drenching thunderstorm Thursday night, we motored home to Burnham where we cleaned up the boat and celebrated our "Great Lakes Motoring Adventure." Despite the uncooperative weather, a good time was had by all. If you're a cruising boat skipper, perhaps you could plan your own "cruising adventure" next year." The Sail Chicago Board met by phone on August 9. Adam Wisneski reported that the consultant for the better organization of our volunteers, Debra Cohen, will begin a series of interviews and on-line surveys this month. All members are encouraged to participate. A 50% reduction of rental fees went into effect during the middle of July. The goal was to increase use of our boats and provide more value to our members. Shawn Lord will evaluate the effect of the rental-price reduction since its close in the middle of August. Instruction is overwhelmed with emails, receiving a hundred a day. Frank McNamara, Michael Stuczynski, and Michael Swisher are clearing this backlog. 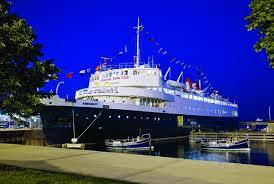 The next meeting will be held at 7:00 p.m. on September 13 at Columbia Yacht Club. You'll get updates, reminders, and other information on Sail Chicago events and activities. Click here.